The No. 16 ranked baseball team dropped two of three over the weekend to No. 5 Florida State before walking off with a win against The Citadel on Tuesday. The two ACC divisional leaders split a doubleheader on Friday, followed by a comeback victory by the Seminoles on Sunday to take the series. The two games against the Seminoles on Friday had nearly opposite results – the Jackets steamrolled to a 10-0 victory in the first game before falling 11-3 in the nightcap. Buck Farmer was the star of the first game for Tech, as he gave up just two hits and zero runs in seven innings of work. The win bumped him up to 2-1 in his career vs. the Seminoles and improved his ERA to 2.33 in those games. On offense, Zane Evans hit 3-for-4 with three RBIs on the day, including a double and a home run. Dylan Dore and Kyle Wren also had multiple RBIs for the game. The second game of the Friday doubleheader swung heavily in Florida State’s favor as they took a 2-0 lead in the first inning and never looked back. Seminole pitcher Scott Sitz picked up the win to remain undefeated this year while Tech expended six pitchers of its own. FSU leftfielder DJ Stewart blasted a grand slam on his way to six RBIs, which was the most for either team in the series. The Jackets still managed to get 13 hits in the game, but could not capitalize as they left 11 runners left on base. Wren matched his season best with four hits and finished 7-for-14 in the series. Tech jumped out to a 5-0 lead in the third game of the series, but was unable to hang on as FSU scored six runs in the final three innings to take the game, 8-6. Tech starter Cole Pitts posted a solid effort, giving up five hits and three earned runs in 5.1 innings of work. Things fell apart for Tech in the sixth when an errant throw allowed two runners to score. FSU’s Seth Miller tied it in the seventh with a two-run double, and Stewart delivered again in the eighth with a two-run single. Following the series, FSU’s record improved to 22-2 (7-2 ACC) while Tech’s stood at 18-5 (6-3 ACC). 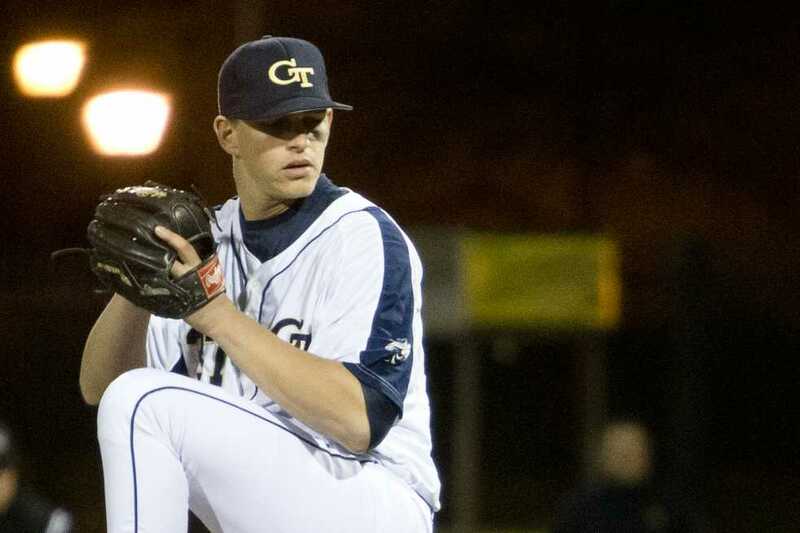 Then on Tuesday, the Jackets had trouble scoring against The Citadel Bulldogs until a late offensive surge capped by a Daniel Spingola walk-off home run. Freshman Jonathan King made his first start for the Jackets and pitched well, giving up five hits in five innings but allowing two runs. In the first inning, Wren extended his hitting streak to 13 games with a single on the first pitch of the game. Action picked up in the top of the fourth when two walks and a single loaded the bases for The Citadel with one out. A single to right field brought home two runs, but that’s all the Bulldogs would do as the next batter grounded into a double play to end the inning. A somewhat controversial play occurred in the bottom of the sixth. Daniel Palka struck out swinging as Dove took off to second on an attempted steal. The throw from the catcher to second was off target, but Dove was called out due to an interference call against Palka. Spingola became the hero, blasting his first career home run to seal the deal for the Jackets. The Bulldogs scored another run in the seventh to go up 3-0, but a Spingola double in the bottom frame cut the deficit back to two. Then in the eighth, a Palka home run brought Dove home and cut The Citadel’s lead to one. A one-two-three top of the ninth set the stage for a dramatic finish for Tech. Matt Gonzalez singled and advanced to second off a Mott Hyde sacrifice bunt. Then Spingola became the hero, blasting his first career home run to seal the deal for the Jackets. He finished the day hitting 2-for-4 and driving in three runs, and Palka finished 1-3 with two RBIs and a walk. Tech is now 19-5 (6-3 ACC) and will host a three game set against Wake Forest this weekend, with games Friday at 6 p.m., Saturday at 4 p.m., and Sunday at 1 p.m.